Loss and grief are part of life and relationships. Every relationship comes to an end, either through a break-up or someone dying. Today I thought we would take a look at how the Tarot can be used as a tool for healing grief and gaining deeper understanding in the process. I am using myself and my own experiences to illustrate this. The five stages of grief do not follow a linear model. Most people who have experienced loss and grief can testify to swinging wildly between stages and even revisiting ‘early’ stages years down the line. Just over a year ago, I was going for my 12 week dating scan. I was 40 and pregnant with my fourth child but his was the first pregnancy I had actually been able to enjoy all the way through and my partner and I were both getting excited about finally seeing our little miracle in the scan images. That scan was the start of three weeks of hell going in and out of hospital (including Christmas Eve and New Year’s Eve), waiting for test results, trying to prepare for all eventualities and finally receiving the worst possible news. After the CVS done on Christmas Eve, the doctor phoned up on the 29th and told us that our baby girl had Edward’s Syndrom (T18), one of the worst genetic disorders known to man and I was faced with the decision of medical termination. ‘Luckily’, my prayers were answered and the decision was taken out of my hands. On New Year’s Eve, a final scan revealed that the baby’s heart had stopped and on the 5th of January this year, my angel baby Willow was born sleeping at 15 weeks, on the birthday of my 9-year-old. I sometimes wonder how I survived the following months on my own since my partner left about a week and a half after we lost Willow. One of the best things I did for myself was to focus on physical fitness, forcing myself to go to the gym even when I didn’t feel like it… I gradually got stronger in every sense of the word but it was undoubtedly the most difficult period of my life and I sometimes wonder about the long-term effects. It seems I still have healing work left to do. Hence I decided to use the tarot cards for personal reflection about the five stages of grief, picking cards that represent each of the five stages and pulling additional random cards (from a different deck in order to allow for duplicates). Notice how all the four Elements of the Minor Arcana are present as the process of grief has to seep through all levels of our being: mental, emotional and physical. 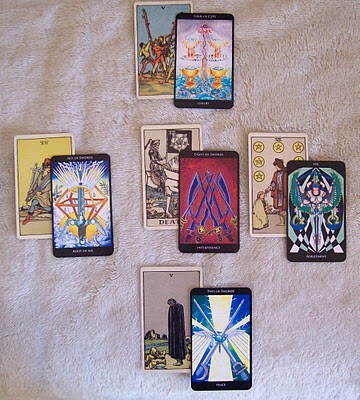 The ultimate spiritual lesson means embracing change, and is represented by the Major Arcana Death card. After laying the cards out in a linear fashion, I decided to lay them out in the shape of a cross before adding a randomly chosen card each for the five stages to represent where I am in the process from the Rosetta Tarot. With all the Air Element cards present it become apparent that I’m intellectualising the grief process at the minute. I’m detaching enough to be able write about it in this blog post so that makes a lot of sense. I feel confident that I have navigated the bargaining space and don’t need to revisit it which the Adjustment card testifies to. The main problem areas are ‘anger’ and ‘acceptance’… The anger seems repressed with the 4 of Cups card challenging the 5 of Wands/anger stage. Death/acceptance is not far off with the 8 of Swords as the main challenge here. I can choose to move on at any time… or as soon as I have given my anger a healthy expression. Choice is also indicated with the 2 of Swords challenging the 5 of Cups/depression stage. This worked really well for me in terms of getting a feel for the energies I’m actually dealing with regards to the grief process. Let me know how you go if you decide to try this spread for yourself!